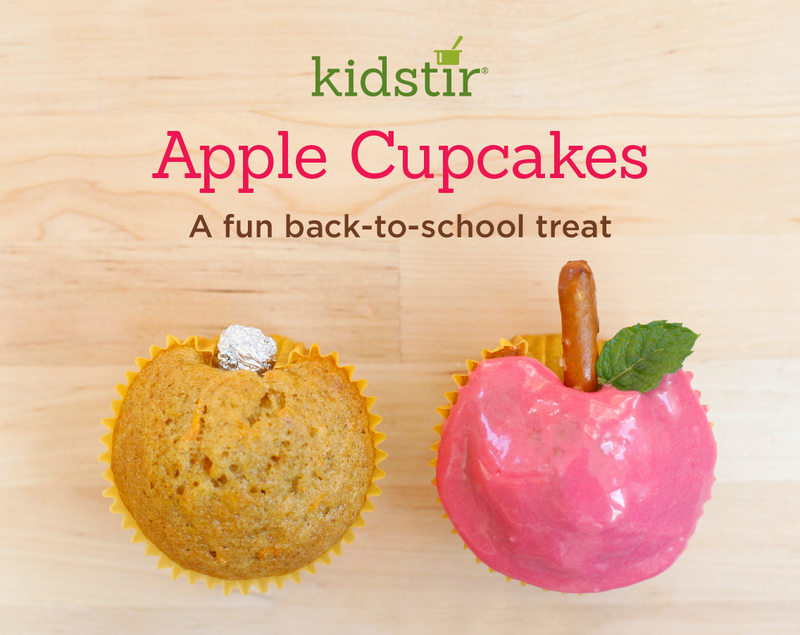 Looking for a fun back-to-school classroom treat? Mix up our Easy Applesauce Muffin batter (or your favorite recipe), then decorate them with natural red frosting, pretzels, and mint leaves to look like apples! 1. Prepare the batter according to recipe directions. Line the muffin tin with paper bake cups. Roll aluminum foil into small balls and place each one between a liner and a muffin pan cup (see photo above). Pour the batter into the liners, then bake according to the recipe directions. 2. Meanwhile, mix up some red frosting. To tint a bowl of vanilla frosting, push the fresh raspberries through a strainer so the juice runs into the icing. Stir it up. Then frost your cooled cupcakes. 3. Press a pretzel stick into the top of each cupcake. Add a fresh mint leaf to each apple. Enjoy!